After a short break, Big Bash league is off and running, only 5 matches are left before the big semifinals and 1 spot is still left to be filled for the playoffs. Every match from here on will be a thriller and exciting as we move into the final leg of the BBL 08. This match at Bellerive Oval, Hobart will not have much effect on the points table as both these teams have qualified for the semis. But both these teams would like to go in the playoffs with a win. Hobart are at the top of the table with 18 points, while Melbourne are 3rd in the points table. If Melbourne wins this match they will move to 2nd position, but keeping in mind the form of Hobart Hurricanes, it will be challenging as they have been the most consistent side of the tournament. Both the teams have made few changes in their squad for this match. Riley Meredith could replace James Faulkner in the playing 11 as he has been rested for this match while Qais Ahmad will be in the playing 11 in place of Jarrod Freeman for the Hurricanes. Renegades top order will be boosted as Marcus Harris has joined the 13 men squad and likely to play tomorrow. Hobart Hurricanes: Matthew Wade (C & W), D’Arcy Short, Caleb Jewell, Ben McDermott, George Bailey, Simon Milenko, Qais Ahmed, David Moody, Jofra Archer, Riley Meredith, Clive Rose. 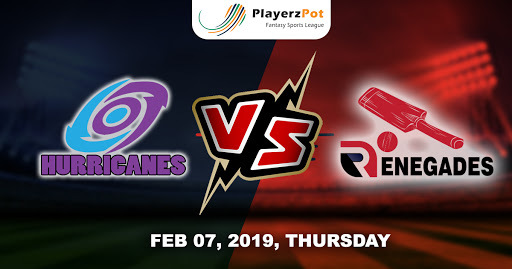 Melbourne Renegades: Aaron Finch (C), Marcus Harris, Mackenzie Harvey, Sam Harper, Tom Cooper, Mohammad Nabi, Daniel Christian, Chris Tremain, Cameron Boyce, Kane Richardson, Harry Gurney. Hobart Hurricanes will win this match as they have been invincible in their home ground.